Many people like to keep up with new product announcements and launches across Microsoft but wish they had an aggregated way to keep track of it all. Meet MSReadr! 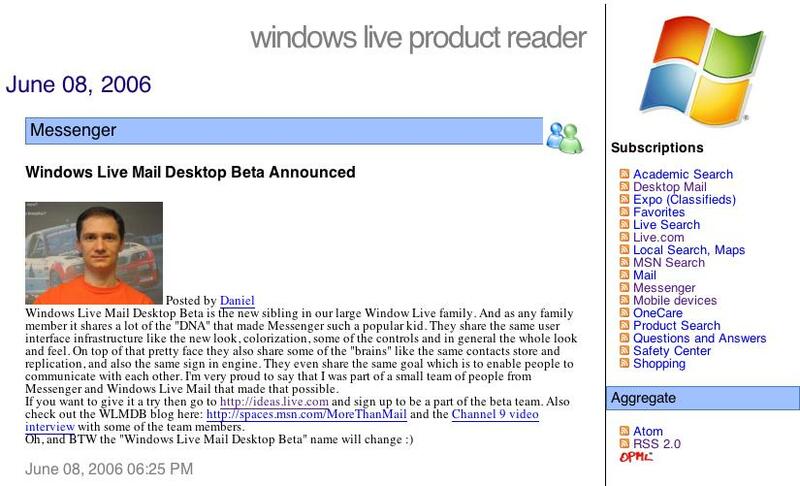 MSReadr is an information aggregator for all of the product team blogs across Microsoft’s Windows Live division. Search, Messenger, Mail, they’re all in there. You can view the latest news right in your browser, subscribe to one feed for updates from all of the blogs, or add the site’s OPML file as a reading list. The site is powered by Python and Sam Ruby’s branch of Planet Planet. The domain name is missing an “e” because that’s the Web 2.0 thing to do. This project was created on a Sunday evening without the approval or blessing of Microsoft. It’s a work in progress.